The fifth-generation diesel subcompact welcomes 2019 with a full revamp. 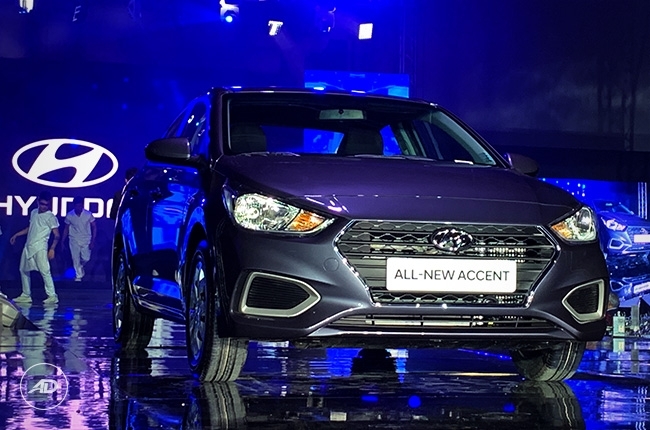 After almost two years since its global debut, Hyundai Asia Resources, Inc. (HARI) brings in the fifth-generation Accent subcompact sedan, signifying the company’s push in the years to come. HARI’s best-selling nameplate may have lingered for a while in the showrooms, but with its revamped looks, it's better late than never. The 2019 Accent solely comes in sedan body type this year, so those who have developed an affection for hatchbacks might get disappointed with this bit. 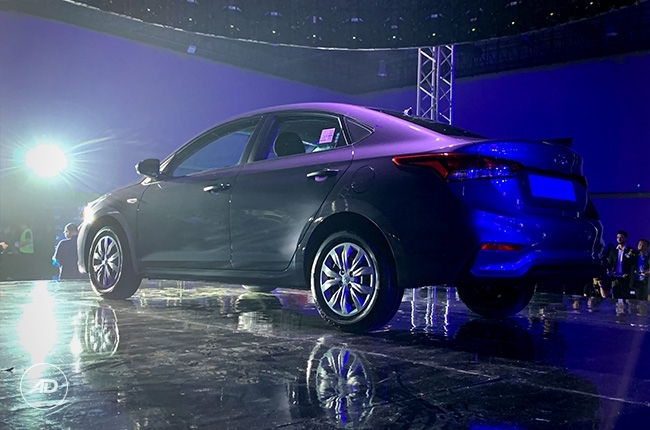 Nevertheless, the biggest change in the subcompact sedan is found in its fascia, specifically the cascading grille, which can be observed in all other Hyundai vehicles in its lineup. 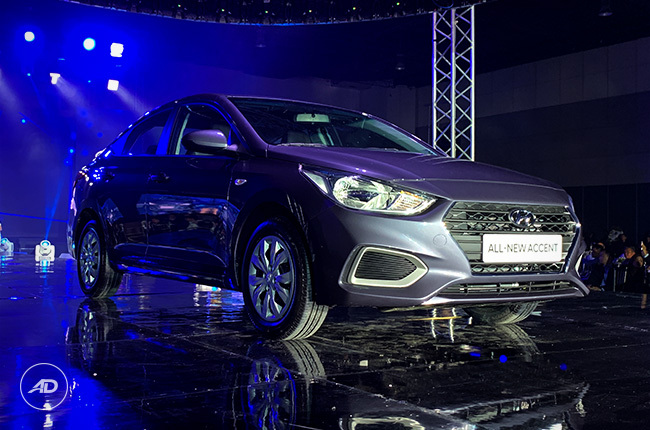 In addition to the new grille, the front clip of the all-new Accent is adorned by satin chrome garnishings in place of the fog lamps. The headlights are narrower than before, and so as the wraparound taillights. 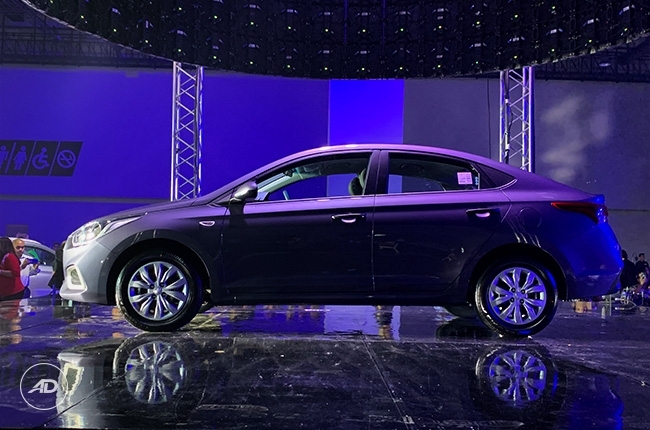 With its new styling, the 2019 Accent is like a smaller version of its brother, the Elantra compact sedan. It also inherits the roofline that flows cohesively onto the trunk, giving the sedan a fastback-ish appeal. 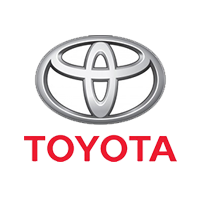 Standard across the range are halogen headlights, bulb-type taillights, and 15-inch steel rims with full wheel cap. As for its size, the 2019 Accent is bigger than its predecessor. It’s 29mm wider, 30mm longer, and has a 30mm longer wheelbase. The height has been retained, albeit, ground clearance is reduced by 10mm. 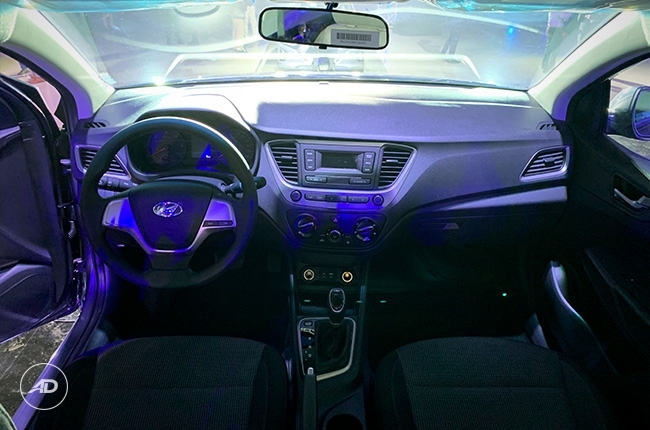 Inside, the 2019 Accent gets the same driver-centric dashboard layout of the Elantra. The fluidic interior has been replaced with a more simple yet still curvy dash, showered with blue illumination plus a lot of piano black and satin chrome accents. The seats are fabric-clad and the rear cabin gets air conditioning vents. 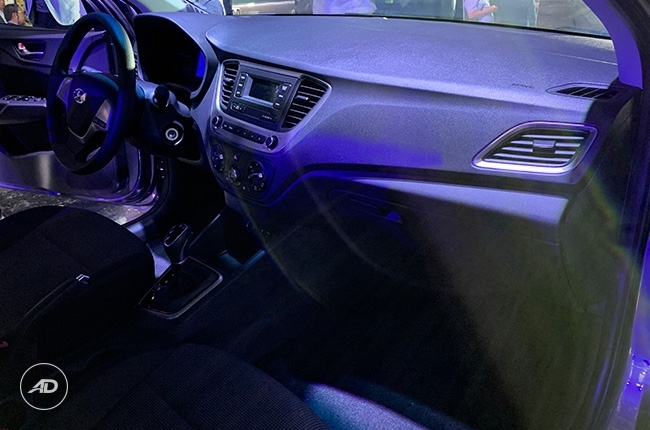 What’s new in the Accent sedan is the inclusion of a 3.8-inch LCD display radio with AUX and USB connectivity. 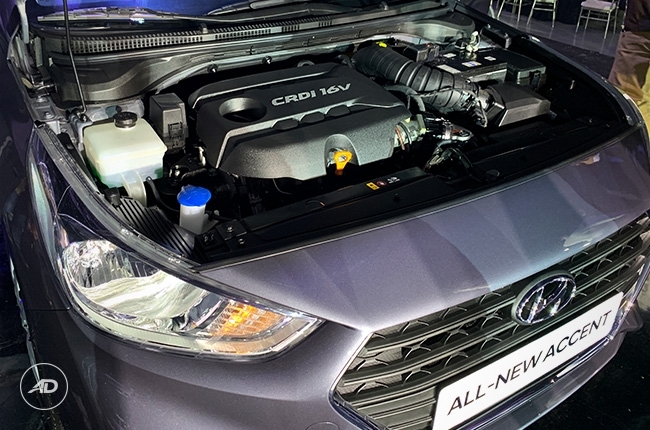 Powering the Accent is a 1.6L CRDi diesel engine with VGT – the very same powertrain setup that made the nameplate a popular choice among Filipino car buyers. What’s surprising, however, is the decrease in power figures, bringing the maximum power output down to 128 hp and 260 Nm of torque. These are essentially lower than before (134 hp and 300 Nm), but still substantially higher than what its key competitors could produce. Transmission choices are either a six-speed manual or a six-speed automatic, transferring power to the front wheels. 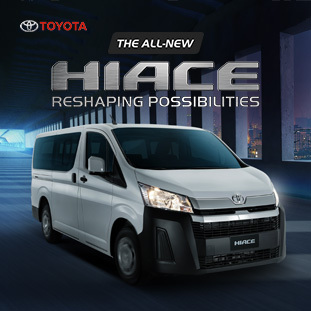 All variants are equipped with ventilated front discs and rear drum brakes. The other engine choice is the 1.4L Kappa gasoline engine that produces 99 hp and 132 Nm of torque. It's available in both automatic and manual transmissions as well. 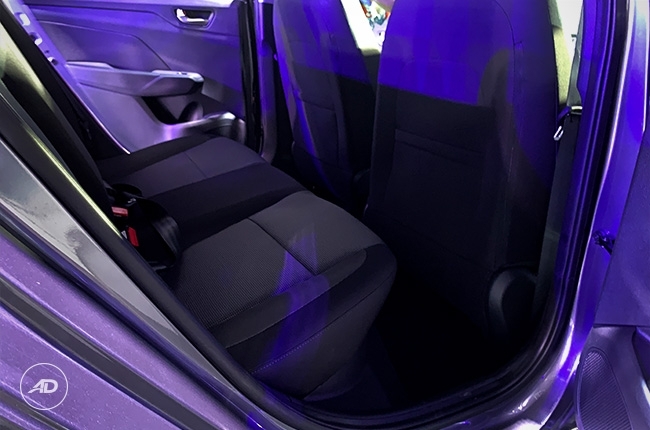 As for safety, the 2019 Accent is equipped with dual front airbags, available in the higher trims of both diesel and gasoline variants. The 2019 Hyundai Accent sedan is available in its five staple colors: Fiery Red, Polar White, Star Dust, Phantom Black, and Sleek Silver. It’s available for reservation as of this writing with the following variants: 1.6 CRDi GL MT/AT (Diesel), 1.4 GL Kappa MT/AT, and 1.4 GL Kappa MT/AT (without airbags). Prices are yet to be announced.